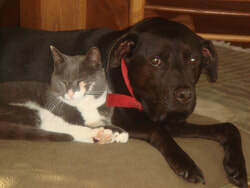 Why Contribute to Vermont Volunteer Services for Animals Humane Society? Welcome to VVSA, the Vermont Volunteer Services for Animals Humane Society. We strive to improve all aspects of the lives of animals and encourage harmonious relationships between them and their human companions. Since our inception in 1986 as a non-profit humane society, VVSA has been a forerunner in animal welfare and protection in Vermont. Our work encompasses humane legislation, senior citizens’ companion animal programs, feral cat rehabilitation, wildlife assistance, animal adoption and the first spay neuter assistance program in the state of Vermont. Your contribution helps VVSA continue its legacy of work and action on behalf of animals, and with maintaining the Wildlife Sanctuary at Curtis Farm. VVSA works with Vermont Licensed Wildlife Rehabilitators to safely relocate orphaned raccoons, skunks, beavers, squirrels, rats, mice, opossums (a.k.a. possums), pigeons, etc. VVSA often gets calls from people who find it difficult to afford the costs of food, shelter, and medical needs of their beloved companions. “Jane’s Fund” is a special fund set up to help us to continue to meet the needs of these animals (please read more about Jane’s Fund below under “Other Ways to Help.” If you would like your contribution to be targeted for Jane’s Fund, please send to the address below, with “ATTN: Jane’s Fund” on the lower left-hand corner of the envelope. VVSA is a non-profit organization with 501(c)(3) status. We receive no federal, state, nor municipal funding, but rely on our own fundraising efforts, donations and volunteers. Any donation is greatly appreciated (and tax-deductible)! Making a simple change in your will and including a bequest to VVSA can help ensure care and advocacy for animals in the long-term. Please call for more information on planned giving options: (802) 672-5302. VVSA is always happy to receive: cat and dog food, kitty litter, hamster “bedding,” office equipment and supplies, as well as dog and cat shelters suitable for winter, which, in turn, we provide to those in need. We are thankful to the Vermont Food Bank for their generosity in enabling us to provide food for animals throughout the state and the generosity of the people supporting the Chelsea Bottle Drive! Through the hands on efforts of Charay Malas & Snook Downing, VVSA has been able to help feed and provide care for many, many animals! !